Both of today’s books are set in Scotland, a country that has long fascinated me. Inspired by Rosemary Sutcliffe’s The Eagle of the Ninth, about the Roman Lost Legion. Verity Gray is an English archeologist who is lured to a dig in Scotland by Adrian, an old boyfriend/colleague. There she learns that eccentric Irishman Peter Quinnell is financing the project. Rumored to be mad, Peter is obsessed with finding the Lost Legion, the Roman Ninth, which marched north into Scotland and disappeared early in the 2nd century AD. She’s especially shocked to learn that Peter picked Rose Hills because a local boy reputed to have second sight had seen a Roman legionaire in the area. Can Robbie’s Sentinel be real? Peter is hard to say no to, and Verity is intrigued by the job as well as attracted to handsome Scotsman David Fortune. And then there is Robbie, a charming and precocious eight-year-old whose predictions are rarely wrong. I especially love the way the animals react to The Sentinel. The cats hiss and arch their backs while Robbie’s collie gambols by the ghost’s side, jumping up occasionally for a pat. Last year I read Susanna Kearsley’s The Rose Garden, and fell in love with her writing style. Her prose is lush and unhurried, as she draws you into the world of her characters. The Shadowy Horses is part archeological mystery, part ghost story combined with a lovely romance. It all makes for a very satisfying mix, on that fans of Mary Stewart will enjoy. I’m so glad I chose the audio version. Armstrong is a marvelous narrator who does a wonderful job, especially with the Scottish accents, which sounded spot on to my American ear. I can still hear her musical cadences even though the audiobook is finished and returned to the library. * The Shadowy Horses page at Kearsley’s website includes location photos and insight into what inspired her to write the story. Kearsley returns to Scotland for this story within a story set on the rugged coast north of Aberdeen. In the modern story, novelist Carrie McClelland arrives in Cruden Bay, a village near ruined Slains Castle, and knows this is where she has to live to write her book about the abortive 1708 Jacobite invasion. Carrie’s story is interspersed with scenes from her novel, featuring one of her ancestors, young Sophia Paterson, who comes to Slains in 1708 to live with a kinswoman. There she meets the love of her life, an outlawed Jacobite who serves James III and finds herself thrust into a world of intrigue and danger. The whole thing becomes eerie when Carrie researches the events of 1708 and discovers that the scenes she has already written are oddly accurate, even down to names of characters she thought she’d made up, but who really existed. Her father suggests it might be a case of genetic memory. Carrie isn’t sure; she just knows this is a story that must be told. 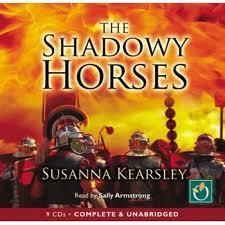 I enjoyed this book, too, though not quite as much as The Shadowy Horses. I liked the fact that it was set in 1708 rather than the more popular 1745 uprising, and the history of Slains Castle is quite interesting. You can check out Kearsley’s location photos at her website. This entry was posted in Recycled Reviews, Uncategorized and tagged historical romance, paranormal romance, reviews, Scotland, Susanna Kearsley, The Shadowy Horses, The Winter Sea by Linda / Lyndi. Bookmark the permalink. I like Susana Kearsley’s stories. I haven’t read The Winter Sea and thank you, for bringing it to our attention! I also use the story within a story technique, though many editors don’t agree with it. I love the story within a story!